This month, We are going to release 2 new Joomla templates: JA Autoshop eCommerce Joomla template for JoomlArt.com and GK Decor - Decor and Interior Design Joomla template for Gavick.com. Let's check PREVIEW of the 2 new templates. 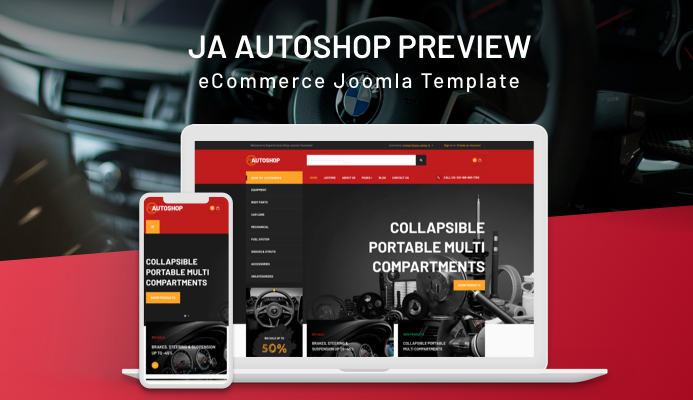 JA Autoshop is our new eCommerce Joomla template designed for multiple shop types: megastore, digital, mechanic, accessories ... websites. It fully supports 2 popular Joomal eCommerce extensions: Virtuemart and J2Store. The beautiful template design with remarkable estore-browsing features, responsive design will make your store looks amazing and help selling your products online easier than ever.